Take 42% off the entire book. Just enter code sscukic into the discount code box at checkout at manning.com. Functional Programming in C++ teaches developers the practical side of functional programming and what tools C++ provides to develop software in the functional style. 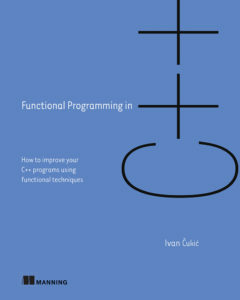 This practical guide starts with an introduction to functional programming that contrasts FP with the imperative style of programming. This book is full of helpful diagrams that help you to understand FP concepts and begin to think functionally. You’ll learn, and with the help of lots of code examples, try out FP concepts like monads, lazy evaluation, and immutable data structures. The last few chapters take you deeper into real-world FP, covering functional design for concurrent and distributed systems as well as testing and debugging. See more about the book in this slide deck.